If you decide for any of our xRover REHA, then you know that you do not bring home a variable medical stroller/ buggy, but it will be also the sport stroller behind the bike. Our product is the only one in the Czech market with the Certificate of Egineering Test Institute for both uses, thus becoming quite versatile: you can take transported person to the city, to join him behind the bike, you can also do activities such as hiking, inline skating, sledge or jogging. The high quality is in the first place for us. Also the materials we use are of the best quality. The stroller has the all-metal chassis; we use superior aluminium alloys, strength parts and the connecting material is exclusively made of the stainless steel resistant in case of changes of climatic conditions. We only use plastic materials exceptionally and only if necessary. Everyone will feel very comfortable in the padded, easy positioning and ergonomically shaped seat. Legs, head and the body can be placed between the supports soft inner liner, five-point safety belt will hold it in place. And there is, of course, plenty of pockets and storage compartments. Regarding health and safety, we have no competition on the market! The absence of connecting elements made of plastic, target oblique suspension, multiple fuse seat fixation insert. All this gives you and transported person feeling of maximum safety. Not to mention the welded tubular frame and protective aluminum arches which protects transported person even during the fall or rollover stroller! 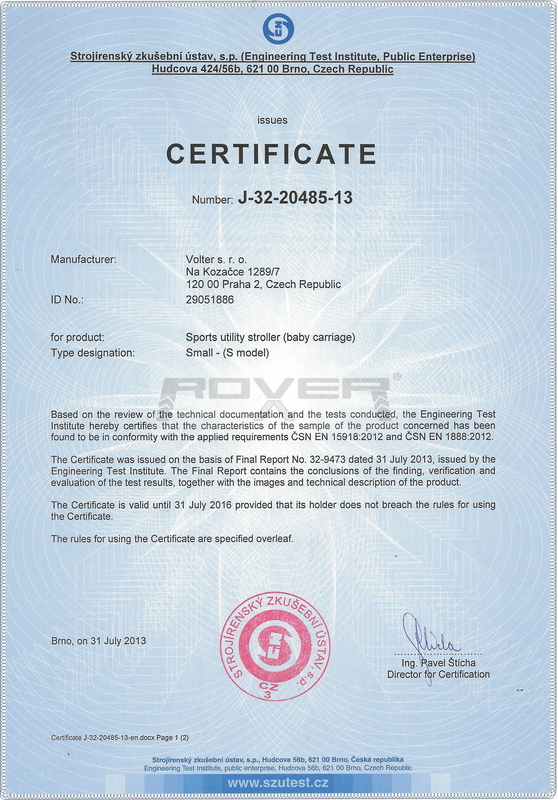 xROVER – model S is tested and certified by the Engineering Test Institute, Public Enterprise (SZU) according to the norms ČSN EN 1888:2012 (as a child buggy) and ČSN EN 15918:2012 (as a bike trailer and sport stroller). It is homologated with CE mark, in accordance with applicable regulations as the medical device of the class 1.
xROVER - M and L models fully comply with the technical regulations in their class and category. They are homologated with CE mark, in accordance with applicable regulations as the medical devices of the class 1. Not everyone has fortune to move without limitations. If you still want to spend time with loved ones and actively expand their options and your social life, we have a modern and unique solutions in the form of innovative medical stroller xROVER REHA. xROVER REHA is a multifunctional medical stroller that thanks its design allows to transport people with limited mobility and provides them maximal safety and comfort. With our stroller you can safely go hiking, make a trip, you can do the sport activities such as jogging, in-line skating or biking. xROVER REHA is a certified medical stroller. Its design and construction differs from standard wheelchair. It is very light and very easy to operate even during transport of adults over 120 kg. It is equipped with many features that make it ideal not only for simple driving in the city, but also in the field or behind the bicycle wheel, or even in the snow. Available in three models, therefore, may offer its services to persons with limited mobility from childhood to adult. xROVER REHA is safe, comfortable and practical! See xRover from all sides and go through all the details. The fully equipped xRover REHA S model. The maximum equipment for or options of use. Optional choice of wheels - 14" and 20" and additional bags. Price-bargain – more favourable than additional separate purchase of accessories. … do not worry about ending up as bad as a guy in a popular movie by Jan Svěrak ... the mudguard is a part of the cyclo-set as a reliable shield protecting to the transported person against pebbles, impurities and mud flying away from the back wheel of the bicycle. Not even one of our xRovers REHA would do without strong drum brakes. They are operated via the central brake level and have the parking lock feature so that, if you want, the stroller does not move even an inch. It is actually a multifunctional tachometer. It is located immediately next to the seat so that both you and the transported person can watch such displayed data as speed or distance travelled on a big display. Modern. Original. Unique. This all is your new xRover. You already know it. And everyone else will find out when they meet you on your trip. You do not have to worry about wasting time with the canopy. You can swiftly take it off and put it on; it has the adjustable joint that allows quick and comfortable setting. The medical stroller is able to pass a door with the standard width of 80 cm; it fits seamlessly into an elevator and can be simply operated in small premises. Unification? Say what? Brake levers for left handed persons or longer handles for really tall persons are as common with us as other individual adjustments you might need. Every driver will be able to see you with xRover. You will find safety reflecting things everywhere – on wheels, on the seat and on the chassis so that you don’t have to be afraid of coming home from a tour at dawn or even at night. The robust design of the front axle with fast-fixative elements and comfortable control brings great comfort when replacing components on the trailer and its modification for various purposes. The maximum safety is our mantra. Therefore, the welded tubular chassis of the trailer has got a completely sophisticated shape; it is made of superior alloys and features protective bows and side duplication and – which is the most important thing – it has no plastic connecting elements! Once you remove the wheels and compose other elements you can transport your stroller in a car without problems. You will also appreciate its compactness if you live in a small apartment. All connecting materials used on the mediacl stroller are made of high-strength stainless steel. This guarantees the long-term service life of your stroller. You have no idea why and for what? Yeah, our water level is unique. It is located on the hub of the rear wheel and will make the setting of the position of hubs on wheel at seat adjusting easier. Do you ask why? Because the slant suspension of wheels manifold increases the side stability of the baby coach but at the same time requires a precise wheel alignment and adjustment of the trailer traction. Therefore, we have got a simple system for the inspection and wheel alignment of the rear axle. Simply look and you will be able to set everything perfectly by tightening one lever. We offer you an unbeatable suspension of the bicycle towing bar. It is made of a high quality stainless steel material enabling the maximum range of the movement. In addition the exercise tests have proven that it is practically indestructible! It does not matter how big you are. With our adjustable handle everyone can set the perfect position that fits him/her at any activity with the stroller.